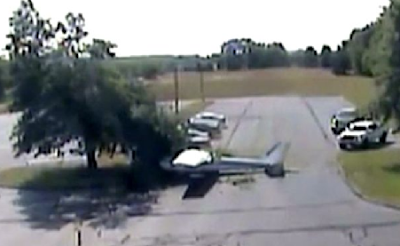 An elderly pilot miraculously survived when his light aircraft plummeted into a tree before crashing down in a car park. 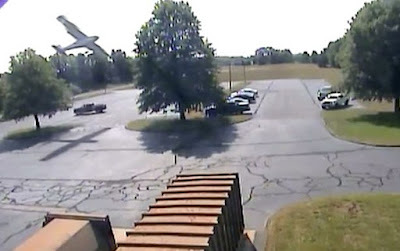 CCTV captured the moment the nose of 79-year-old Manfred Forst's small plane swooped over the parking area and clipped a tree. 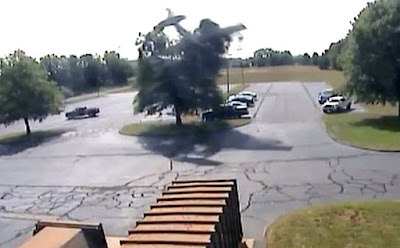 Dramatic footage shows it spinning over in the air before smashing into the ground next to several cars in the Connecticut, US, lot. Authorities say that incredibly no one was seriously injured in the crash in Plainville yesterday morning. But, Manfred was taken to hospital with minor cuts and scraps. He told NBC that he was 'on his way to breakfast' when the accident happened at around 11.25am.